The 81-year-old was awarded the third-highest civilian honour of the country in 1992. Social activist and a vociferous propagator of the anti-corruption ombudsman, Lokpal, Anna Hazare, whose indefinite hunger strike entered the fifth day on Sunday, warned that if the Narendra Modi government did not fulfill its promises, he would return his Padma Bhushan. “If this government does not fulfil its promises made to the country in the next few days, I will return my Padma Bhushan,” he told news agency PTI on Sunday evening. “(The) Modi government has breached the faith of people,” he said. Earlier on Sunday, Bharatiya Janata Party ally Shiv Sena came out in Hazare’s support, urging him to emulate socialist leader Jayaprakash Narayan and lead an agitation against corruption. 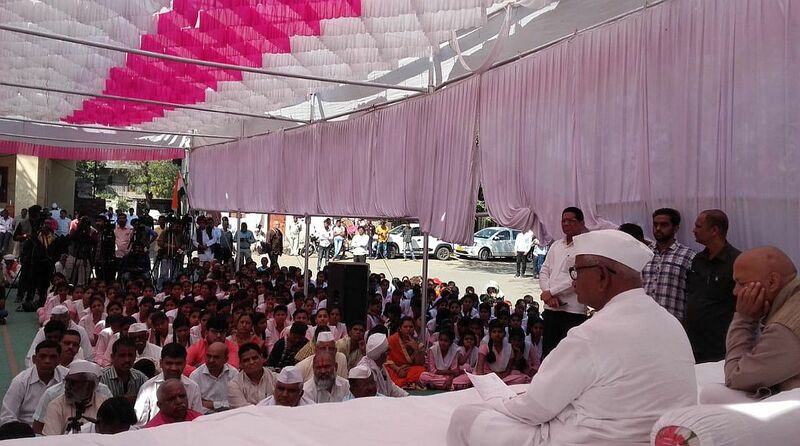 Hazare has been on fast since January 30 at his native Ralegan Siddhi village in Maharashtra, demanding appointments of Lokpal and Lokayuktas and resolution of farmers’ issue. Hazare’s demands include the immediate appointment of anti-corruption ombudsmen Lokpal at the Centre and Lokayuktas in states, and the implementation of Swaminathan Commission’s recommendations for tackling agrarian distress and electoral reforms. Hazare has lost 3.8 kg in the past five days and his blood pressure, blood sugar and creatinine level in the urine had gone up, a doctor said. Around 5,000 farmers from the district are likely to stage a protect outside the Ahmednagar collector’s office on Monday to support Hazare’s agitation, his associates said. The decision to hold the protest was taken at a gram sabha at Ralegan Siddhi on Saturday night. Leaders of various political parties from Parner tehsil were present at the meeting. Anna Hazare had earlier sat on a fast at the Ramlila Maidan in Delhi on March 23 last year but called it off after the PMO gave a written assurance that his demands would be fulfilled.